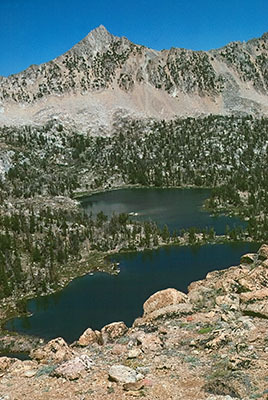 Here are two of the Boulder Chain Lakes in Idaho’s White Clouds Mountains. The chain contains 13 lakes in the drainage. Because of the scenery and the wildlife habitat, especially further to the east, Idaho conservationists have been struggling for a Wilderness designation since the late 1960s for these and the adjacent Boulder Mountains. Whether the non-wilderness side payments in CIEDRA to anti-wilderness or wilderness indifferent groups are too much, or not enough, has become an issue that extends beyond Idaho.